Wake up. Realize it’s too early to get up, roll over and go back to sleep. The dog’s whining. Why’s the dog whining? Why is the dog HERE when he should be out for his walk with the other human? Go into living room. Oh news is on. Oh there’s a fire…again. Oh…IT’S HALF A BLOCK AWAY! Enter the other human who has been trying to get on the roof to see what’s happening because his sanity is broken. 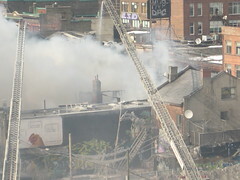 Half a block of buildings on Queen Street between Bathurst and Portland are affected. Turn of the century buildings that are among the oldest commercial structures in the city. 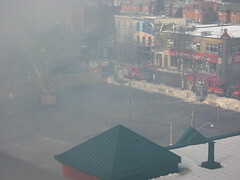 One building has collapsed, another close to it and at least 4 others completely gutted. Duke’s Cycle, a family business that has survived for 3 generations is gone. The building, their home, their livelihood…gone. A few doors down is Suspect Video, completely gutted, with the building close to collapse. Ironically, we returned our dvd’s on time this weekend…a season of “Rescue Me”. All personal information collected through paypal is for the express purposes of getting your yarn to you! Your email address will be shared with our designers for the purpose of providing you with pattern updates only. Other than that, we do not share, sell or lend your information to anyone for any purpose.